Whether you’re weaving through traffic on your commute, or cruising down the streets of the City of Angels, fuel-efficiency, interior comfort, trim choices, and performance power are musts. The newly engineered Honda Fit will deliver in all three areas, and leave you with plenty of gas for a weekend trip to Santa Monica Beach. Contact us to schedule a test drive today! 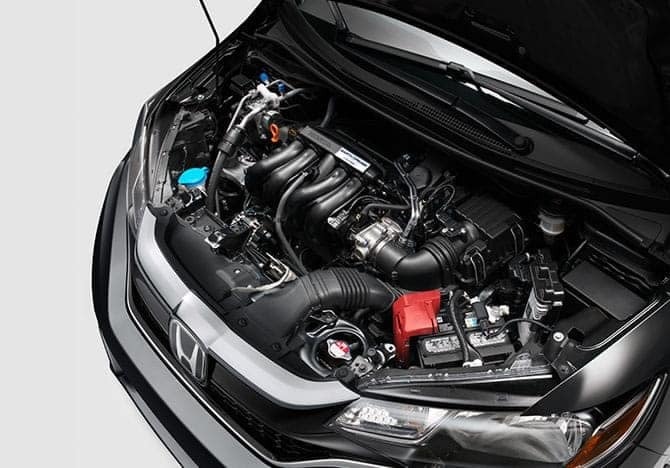 This 1.5L engine packs a punch, giving the Fit agile performance and handling. The 4 Cylinder engine makes maintenance a breeze as well. With 114 lb.-ft. of torque, the Fit delivers sports car performance for an inexpensive, subcompact chassis. With 31 MPG combined on the base trim, your Fit can run marathons with fuel left in the tank. The CVT-equipped trim sports 36 combined MPG. This package pumps out a sleek, athletic aesthetic, with 16-inch black alloy wheels with a wheel graphics kit, two extra spoilers, and sport suspension, to deliver MVP-worthy performance. With over 15 years of consumer and expert approval, the Consumer Report-acclaimed Honda Fit delivers impressive performance and handling specs, especially for a subcompact vehicle. The standard 6-speed Manual Transmission means less maintenance and more fuel-efficiency, and the Continuously Variable Transmission trim level improves the fuel-efficiency of this already environmentally friendly vehicle. In addition, this trim level offers Honda’s patented Eco Assist system, which helpfully monitors your driving style, making your Fit even environmentally fitter. And with patented Vehicle Stability Assist, an Antilock Braking System, and Brake Assist technology, the five-seat Fit drives as safely as it performs: you won’t need to worry about abrupt pedestrian traffic, or those confusing city intersections. Available Honda Sensing technology equips you with Adaptive Cruise Control, Lane Keeping Assist System, among a host of other features, ensuring that your high-performing Fit will fit in the narrow city lanes. Visit us at 5850 W Centinela Ave in Los Angeles, to check out this lean machine today.